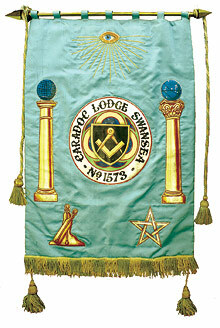 The formation of a third Swansea Lodge was first raised at a finance committee meeting of Indefatigable Lodge No.237 on 13 February 1874, when a Petition was produced by WBro George Bradford in favour of a new Lodge, to be called ‘Perseverance’. George Bradford had been Installed WM of Indefatigable Lodge in 1872. Originally from Leominster, he was President of the Licensed Victuallers Association for the town and district of Swansea. It was agreed to refer the matter of forming a new Lodge for consideration at the next Regular Lodge Meeting, but it was further deferred to an Emergency Meeting held on 30 March. A Deputation was then received but, principally on account of Indefatigable Lodge being in debt, it was resolved that it was not expedient to comply with the prayer of the Petition, which had been signed by Bro C Maggs and forty other Brethren. Several Brethren refused to abandon the matter, and on 6 August, 27 Members of Indefatigable Lodge, of whom only 3 were Worshipful Brethren, signed another Petition. They included WBro Lawrence Tulloch, PPGReg, WM in 1871, a native of the Shetland Islands, who founded with his brother, Gilbert, a successful ship-chandlery business, in Adelaide Street, Swansea. Lawrence became Mayor of Swansea, 1887-1888. The other two were WBro William Henry Tucker, IPM, Ship Owner; and WBro James Goodall, WM, Draper, with premises on the corner of Castle and College Streets. The WM Designate was Bro John Rogers, PProvGStB, SW, with Bro James Livingston, Mayor of Swansea as SW Designate, and Bro Rev John James Stevenson Moore, LLD, ProvGChap, Chaplain of Indefatigable Lodge, as JW Designate. A few days later, at a Regular Meeting of Indefatigable Lodge, on 9 August 1875, the subject of the Petition was mentioned once again, and was supported by WBro William H Tucker, who, speaking ‘without hostility to this Lodge, that if there was a third Lodge in Swansea, it would tend to the future good of Indefatigable, as some members grumbled at their progress in the Lodge.’ Evidently, the Lodge was still not prepared to recommend the Petition. On 19 August, at a Regular Meeting of Talbot Lodge No.1323, Swansea, the Petition obtained the support of Talbot Lodge, and was signed by the WM, Wardens and 7 other Officers and Past Masters. Thereby, Talbot Lodge became the Sponsoring or Mother Lodge, even though all 27 Petitioners were from Indefatigable Lodge. Seven of the Indefatigable Petitioners went on to become Worshipful Masters of the new Lodge – John Rees Davies, WM in 1884; William Dobbs, WM in 1880; David Cornelius Jones, WM in 1881; James Livingston, WM in 1877; William Michell, WM in 1878; John Rogers, WM in 1876; and Jonathan Charles Sladen, WM in 1879. The Warrant for Caradoc Lodge No.1573 was granted on 8 October 1875. It is not known why the Lodge name was changed from ‘Perseverance’ to ‘Caradoc’. 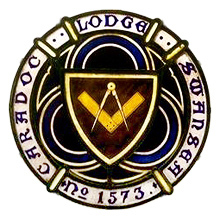 There are currently two other Lodges bearing the name ‘Caradoc’ under the Registry of UGLE: Caradoc Lodge No.1674, Rhyl, North Wales; and Caradoc Lodge No. 4749, Castle Eden, Durham. ‘The ceremony took place on Thursday last 17 inst. at the Masonic Hall, Caer Street, Swansea. There was a large gathering of brethren, every lodge in the province being represented, together with an unusually large muster of visitors from the sister province and the neighbouring towns. The Lodge was opened at two o’clock by Brother George Bradford, PProvGSuptWks, PM Indefatigable Lodge, assisted by the Past Masters and officers of the same Lodge. The lodge having been opened in due form, the R. W. the Provincial Grand Master, Brother Theodore Mansel Talbot; the W. the Deputy Provincial Grand Master Brother Edward James Morris; and the officers of Provincial Grand Lodge, entered the lodge in procession, marshalled by the ProvGDC, WBro Evan Thomas, WM St David’s Lodge No. 679, Aberdare. The Chair having been taken by the RWProvGM, Brother James Goodall, ProvGReg and PM of Indefatigable Lodge read the Petition and Warrant of Constitution. The Ceremony of Consecration was performed by the RWProvGM in his usual masterly and impressive manner, assisted by the Deputy Provincial Grand Master, and by Brothers Marmaduke Tennant, PProvSGW, PM Afan Lodge No.833; Rowland Thomas, PProvJGW, PM Cambrian Lodge No.364; Sigmund Weichert, PProvSGD and WM Glamorgan Lodge No.36, Brother Evan Thomas ably assisting as ProvGDC. The Oration was delivered and the customary prayers were offered up by the ProvGChap, Brother the Reverend J J S Moore, L.L.D. ; and Bro Arthur L Struvé presided with great ability at the organ. At the conclusion of the Consecrating Ceremony, the WM Designate of the Caradoc Lodge, Brother John Rogers, PPRGStdB, was presented to the ProvGM by the DepProvGM, who referred in terms of high commendation to the zeal, ability and Masonic knowledge displayed by this Brother, who was installed as first WM in accordance with ancient custom. The ceremonial observances being conducted throughout by the R.W. ProvGM. The original By-laws of the Lodge were considered and agreed at an emergency meeting on 27 March 1876. Meetings continued to be held at the Masonic Temple, in Caer Street, until September 1926, when the move to the present premises in St Helens Road took place. The death of RWBro Theodore Mansel Talbot, ProvGM, was announced at the Lodge Meeting of 3 July 1876, when tributes were paid to this distinguished Freemason. It is probable that the Consecration of Caradoc Lodge was his last public duty. Initially, Lodge Meetings were held on the first Monday of each month throughout the year. Over the years, a number of gifts have been made to the Lodge. In 1885, RWBro Samuel Rowson, Past District GM for China, who had attended the Installation Meeting the previous year, presented an engraving of the Installation of HRH The Prince of Wales as Grand Master. A box of Working Tools was presented by the Lodge Brethren in 1892, which is still in use. In 1902, WBro William John Treharne, WM, presented a WM’s Collar chain, inscribed: ‘Presented to Caradoc Lodge in memory of the Coronation of King Edward VII’. Bro F A Rees presented rough and perfect Ashlars in 1929, for use in Ceremonies. These had been hewn from a quarry on the North side of the walls of Jerusalem, adjacent to the Temple area. Other presentations include a water filter, given in 1876 by Bro William Dobbs, JD, for use by Caradoc and Indefatigable Lodges; three Gavels for the WM, SW and JW, presented in 1891 by WBro John Henry Taylor, IPM; three more Gavels presented in 1936 by WBro W Bates and, in 1947, WBro Walter Hyman, IPM, presented three alms plates, suitably inscribed and made from oak timber taken from HMS Caradoc, which was being broken up at Briton Ferry wharf. The Caradoc Lodge Jubilee was celebrated on 17 February 1926, an Emergency Meeting being arranged to allow the occasion to be held on the precise Anniversary. All Offices were occupied by Past Masters. WBro J Lloyd White, first Secretary, then residing in Shrewsbury, was present and read the original Minutes of the Consecration Ceremony – ‘without the aid of spectacles’, it is recorded! The Past Master’s Jewel, presented to the late WBro John Rogers, the first WM of Caradoc Lodge, was returned to the Lodge at this Meeting. It was agreed at this Meeting to offer the Swansea Masonic Hall Company Ltd a Master’s Chair for the new Masonic building in St Helens Road, when completed. The cost of the Chair was £135, and it was manufactured in the carpenter’s shop at the Ben Evans Store, Swansea, then the premier fashions and furniture retailer of the town. WBro Arthur Thomas accepted the offer on behalf of the Directors of SMHC Ltd. The last Meeting of Caradoc Lodge in the Caer Street Temple was on 6 September 1926. The first Regular Lodge Meeting of Caradoc Lodge in the new Temple, St Helens Road, was held on 4 October 1926. A donation to the Royal Masonic Benevolent Institution of £1,050 in 1945 was confirmed by the Grand Secretary, resulting in the Lodge having the honour of being declared a Patron of the RMBI. In 1971, RWBro the Rt Hon the Lord Swansea, ProvGM, launched an appeal for £10,000, to fund the Edgar Rutter Memorial Chapel, at the AEPWC, Porthcawl, in recognition of that worthy Freemason’s forty years of service as DepProvGM. Caradoc Lodge agreed to support the appeal. The Centenary of the Lodge was celebrated at the Installation Ceremony of Bro Fred J Wilde, on Monday, 1 March 1976. RWBro the Rt Hon the Lord Swansea, DL, ProvGM, was in attendance, accompanied by the AProvGMs, WBro Harold Wilson, PSGD, and WBro Llewellyn G Bevan, PSGD. Sixty Members of Caradoc Lodge and one-hundred and four visiting Brethren attended. The Lodge Warrant was read by WBro Joseph Williams, PPrGW, WM in 1941, and a short history of the Lodge was given by WBro Richard Bertram Bates, PPrGW, WM in 1942. The Centenary Warrant was read by the Provincial Grand Secretary before it was presented to the WM by the ProvGM. The previous day, Sunday, 29 February, a ‘Service of Devotion and Thanksgiving’ had been held at St Luke’s Church, Cwmbwrla, Swansea. The first lesson was read by WBro Peter R Davies, WM; the second lesson by WBro Joseph Williams, WM in 1941; and the Address was given by WBro Rev Canon Thomas Kenneth Brundsdon, PPGW, AGChap (Eng), Vicar of Newton, Swansea. During WW1, two serving Caradoc Brethren were killed in action; Bro Charles E Lloyd and Bro Richard Bellamy Sheppard, MC. In addition, sons of Brethren made the Supreme Sacrifice, namely WBro W Rosser, Bro E J Williams, and WBro O Owen, together with the blood brothers of Bro John and Bro A Bates. Three instances of sons of Brethren being wounded include those of WBro Owen Owen, Bro Rees E Edmunds, and Bro R W Roberts. The son of Bro T Merrells was taken a Prisoner of War. Caradoc Lodge Brethren serving in WWII were spared death in action, but sons of WBro R B Bates and Bro L Evans lost their lives. WBro W D Rees and his wife were killed in an air raid on Swansea on 21 February 1941 and, in that same raid, the St Helens Road Ironmonger business of WBro R B Bates was totally destroyed. Lodge Meetings continued without attendances being markedly affected, although Festive Boards were restricted. The threat of air raids caused Meetings to be held at 2.30 pm on Saturday afternoons by the end of 1940 and in the winter of 1941. At the close of the Regular Meeting of 7 May 1945, Brethren were advised that a Declaration would be made by the Prime Minister, the Rt Hon Winston Churchill, at 3.00 pm on 8 May 1945, stating that the war in Europe was at an end. From the outset, Caradoc Lodge was able to attract Brethren of some substance. The first WM, WBro John Rogers, PPrGSwdB, proved to be a most distinguished Freemason and a prime mover in the formation of Talbot Chapter No.1323. At his funeral in Danygraig Cemetery on 22 April 1914, Brethren were instructed to wear white gloves. The first SW, Bro James Livingston, was a well-known coal exporter and American Consul, in addition to serving as Mayor of Swansea. Other Caradoc Brethren who also served as Mayors of Swansea include WBro Thomas Arthur Merrells, WBro Thomas Taliesin Corker, WBro David Davies, and WBro William Daniel Rees (killed in an air raid on 21 February 1941). An early Member who came to prominence was WBro Rev Thomas Walters, DD, Vicar of Llansamlet. He was Initiated on 2 April 1877 and Raised on 2 July 1877, immediately Invested as Lodge Chaplain, becoming ProvGChap in May 1880. He served as WM of Caradoc Lodge in 1882, gaining eminence for his support of three bi-lingual Churches at Llansamlet, Glais and Ystradgynlais. Walters Road, Llansamlet, is named in his memory. In April 1880, he proposed the Rt Hon the Earl of Jersey, a Member of Apollo University Lodge No.357, Oxford, as a Joining Member. The Earl of Jersey remained a Caradoc Lodge Member until June 1912. Although a number of letters of apology for non attendance are recorded, there is no evidence of him being in attendance throughout this period. Caradoc Lodge has two Daughter Lodges, both in Swansea, namely, Beaufort Lodge No.3834, Warranted on 11 January 1918; and Sketty Hall Lodge No.8752, Warranted on 8 December 1976. Caradoc Lodge also played a significant part in the formation of Dr James Griffiths Hall Lodge No.3161, Warranted on 3 April 1906. Of the 23 Petitioners for that Lodge, 13 were Members of Caradoc Lodge. The Petition was recommended and signed by the WM and Wardens of Indefatigable Lodge, thereby making it the Sponsoring Lodge, even though only 4 Petitioners were Members of that Lodge. There is only one recorded instance of the Brethren of Caradoc Lodge appearing in public in full Regalia. This was following the Installation of Rev Thomas Walters, DD, in 1882, when, by Dispensation from the ProvGM, the Brethren formed a procession from Caer Street to St Mary’s Church for a service. The Offering on this occasion was for a new East window in the Church, though sadly it was later destroyed in the air raid of 1941. Following the service, Brethren returned to the Lodge for the closing and then to the Cameron Hotel for the Festive Board. Differing points of view between individual Lodges and Provincial Grand Lodge are rare, but such an occasion occurred in September 1921, when Caradoc Brethren agreed to advise PGL that it would not participate in a plan to form a Masonic Library and Museum in Cardiff. Members were of the opinion that books and objects of interest relating to Swansea should remain in the town. Records for 1927 show that the Master was to present WBro E R Jones, PPSGW, ‘a purse of gold to commemorate his Golden Wedding.’ A ‘purse of gold’ had also been presented in 1908 to WBro Charles David Richards, ‘for services rendered.’ He had been Installed as WM in 1896. A Meeting of Provincial Grand Lodge, under the Banner of Caradoc Lodge, was held in Swansea on 19 June 1930, with RWBro Sir Charles L D Venables Llewelyn, Bart, ProvGM, presiding. The effect of the Depression on the economy of South Wales is illustrated by the following event. In 1930, United Grand Lodge proposed an increase in the per capita charge from sixpence per annum to sixpence per quarter. The Brethren, meeting on 3 November 1930, resolved to inform Provincial Grand Lodge that ‘due to the distressing conditions at that time in South Wales, it was not an appropriate time for such an increase’. Despite the obvious poverty in the area at that time, the meeting was attended by 91 Caradoc Brethren and 55 visiting Brethren. Provincial Grand Lodge was also mindful of resisting the increase. The WM stated that he intended to travel to London to be present at a meeting of United Grand Lodge in December 1930, when the matter was to be considered. He invited the Past Masters and Wardens also to attend and support Provincial Grand Lodge in voicing opposition to the proposal. The Lodge Insignia consists of a shield incorporating the Square and Compasses, surmounting a trefoil, presumed to represent the three Principal Officers, the whole enclosed in a circle inscribed with the Lodge name, number and town of origin, Swansea. The Lodge Banner bears the above Insignia design between the two great pillars, on which are placed the celestial and terrestrial globes, the pillars being supported by the Level and Plumb Rule and five-pointed star respectively, the whole surmounted by the ‘All Seeing Eye’. The Lodge has no Motto. It was recorded that on 7 November 1881, ‘thanks for the presentation to the Lodge of a handsome Banner’ by WBro WC Jones, WM, were made. The Banner remained in continual use for over ninety years, with renovations made in 1954, by the wife of Bro Daniel. A gift of a replacement Banner (illustrated) was made in March 1972 by a Brother, who wished to remain anonymous. The original Banner was incorporated in the new Banner as a liner. Returning to more recent times, in 1978, a contribution was made toward the cost of a memorial window in St Luke’s Church, Swansea, in memory of Rev Bro Tom Walters, who had served as Lodge Chaplain. In April of the following year, a Past Masters’ Meeting debated the possible extension to the Masonic building in Swansea. The proposal receiving a mixed response and, what was thought to be a high cost venture, did not proceed further. By the end of 1986, a request had been made to the Grand Charity to set up a Relief Chest for Caradoc Lodge, which was granted. In March 1994, approximately £16,000 was transferred from the Lodge charity chest to honour the pledge given to the 1999 Festival Appeal. As a result of this effort, the Lodge received a Silver Award, in the form of a ‘permanent Jewel’ to be attached to the Charity Steward’s Collar, in recognition of the support given by Members of the Lodge to the ‘Samaritan Fund Appeal’.